The Valet Limited power turning seat (formerly called the Compact Lift-Up� Seat) from Bruno Independent Living Aids is a premium level turning seat designed to provide easier access to select minivans and select SUV's. It has a wide variety of upholsteries available to blend into your vehicle and comes standard with flip-back armrests. It is operated by a simple control pendant that controls the up and in motion, the out and down motion, recline of the seat and forward and backward seat movement. 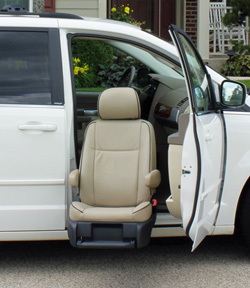 The Valet Limited seat is available for passenger side installation only in either the front or mid position of the vehicle. Installation of this power seat involves the removal of the existing vehicle seat and replacing it with the Valet seat base and seat. No permanent modifications are done to the vehicle allowing the Valet to be removed for transfer to another vehicle and re-installation of the original seat. Use of this seat is pretty simple. The user sits on the seat, pushes the "IN" button and the seat lifts and rotates into the vehicle. 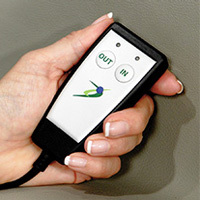 To exit the vehicle the user draws their feet back to the seat, pushes the "OUT" button and the seat rotates them out and lowers them to the desired height. For those who are unable to hold their feet back comfortably an integrated flip-down footrest is included. The control pendant also provides control of the forward and back position of the seat and the amount of recline in the seat the user wants electrically. Note: The Valet Limited turning seat was formerly named the Compact Lift-Up Seat. Throughout the video the Valet Limited is referred to as the Compact Lift-up.